In 1964 Crockett led a team of lawyers in Jackson, Mississippi who defended civil rights workers participating in the Mississippi Freedom Summer Project. Crockett and other attorneys searched for missing civil rights workers James Chaney, Andrew Goodman, and Michael Schwerner when local police officials refused to investigate their disappearance. Eventually the bodies of the three young men were discovered. In 1966 Crockett was elected a judge of the Recorders Court in Detroit, a position he held for the next eight years. In 1974 he was elected Chief Judge of the Court for a four year term before retiring. 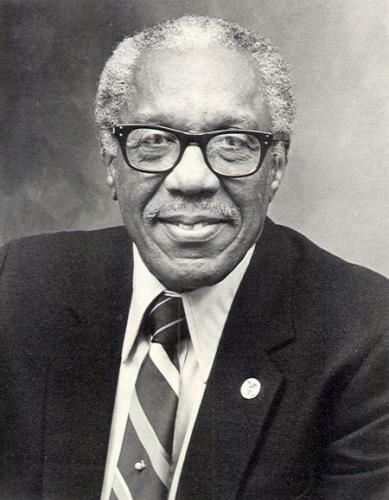 In 1980 George Crockett declared his candidacy for Michigan’s 13th District Congressional seat left vacant by the resignation of Congressman Charles Diggs. Crockett won the special election. House Speaker Thomas “Tip” O’Neill swore Crockett into his seat on November 12, 1980. Crockett’s wife, Dr. Harriett Clark Crockett, and son, George W. Crockett III, were at the ceremony as was his 96-year-old mother, Mrs. Minnie Crockett who recited a poem for the occasion. Though Crockett was elected to Congress at the age of 71, he would continue to represent the people of the 13th District for a decade. His political interests focused on South Africa’s policy of apartheid. As a member of the House Africa Subcommittee he authored the Mandela Freedom Resolution which called on the South African government to free Nelson Mandela. In 1984, Crockett, Detroit Mayor Coleman Young and others were arrested and jailed for anti-apartheid protests outside the South African Embassy in Washington, D.C.
Crockett retired from the U.S. Congress on January 3, 1991 at the age of 82. He continued to be politically active in Detroit until his death on September 7, 1997, five days after a stroke.